We got this game in the post last week and cracked it open asap. We started by playing the core game. So you just move your meeples and roll the dice until only one of you is left. 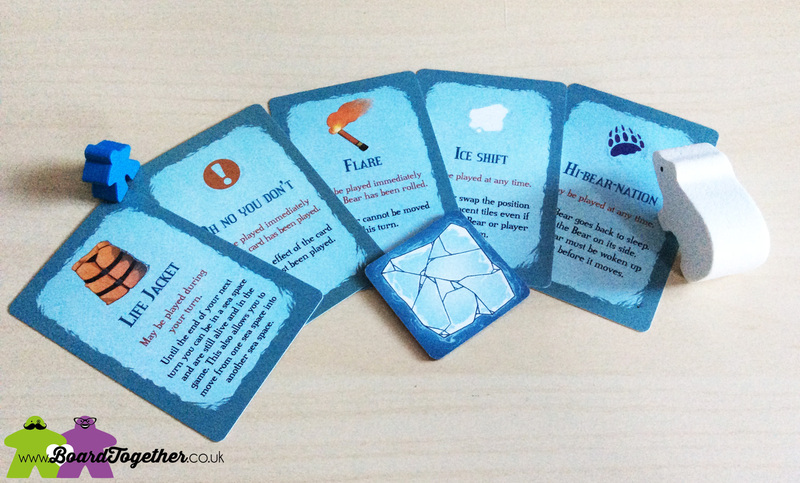 We then moved on to the intermediate game with card actions to contend with. It was great having the different levels of gameplay. It makes me think it can be adapted for younger players as needed. Then again, it can be made even harder for more advanced players. 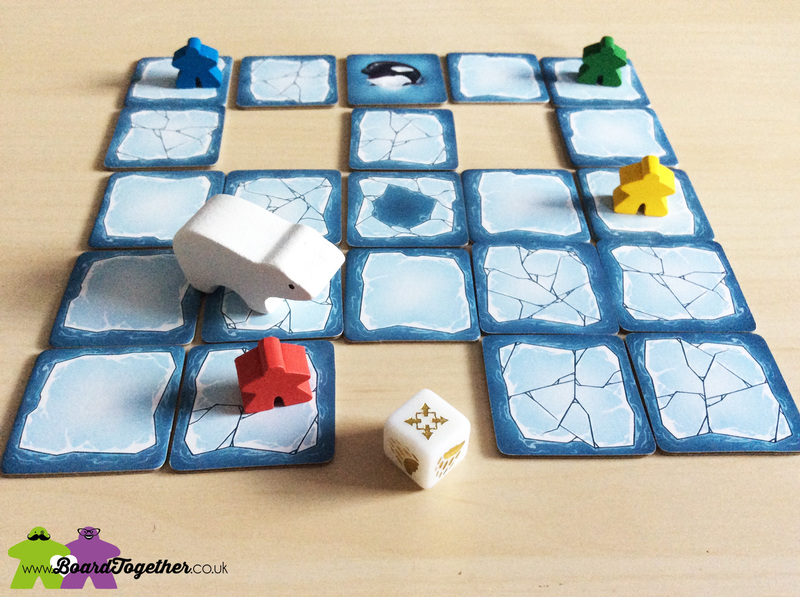 We already love the idea of an alternative board set up to the standard grid pattern of ice tiles. A big part of this games charm is in the thematic artwork. 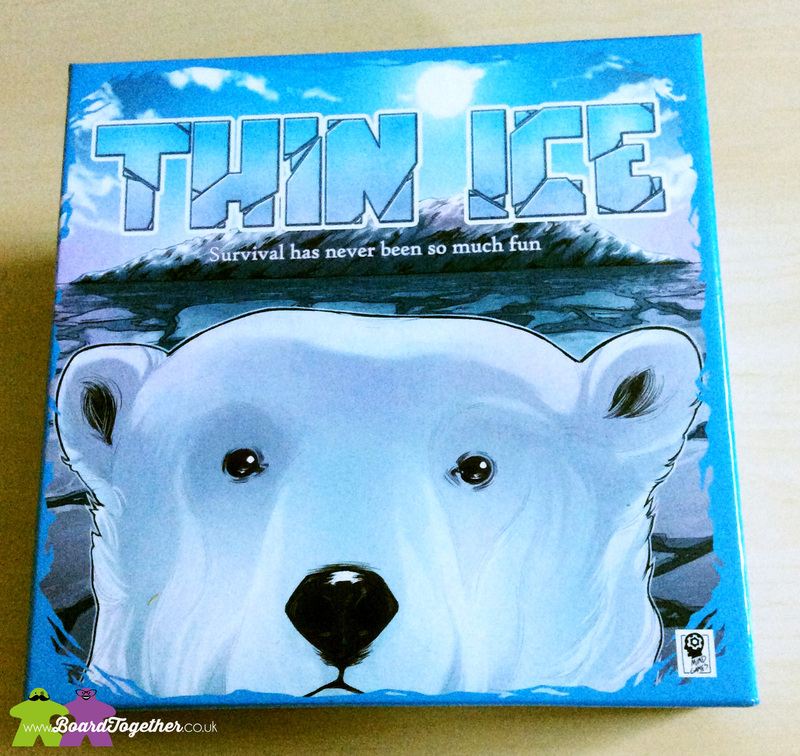 There is a fantastic polar bear on the box cover that grabbed my attention for the Kickstarter campaign. 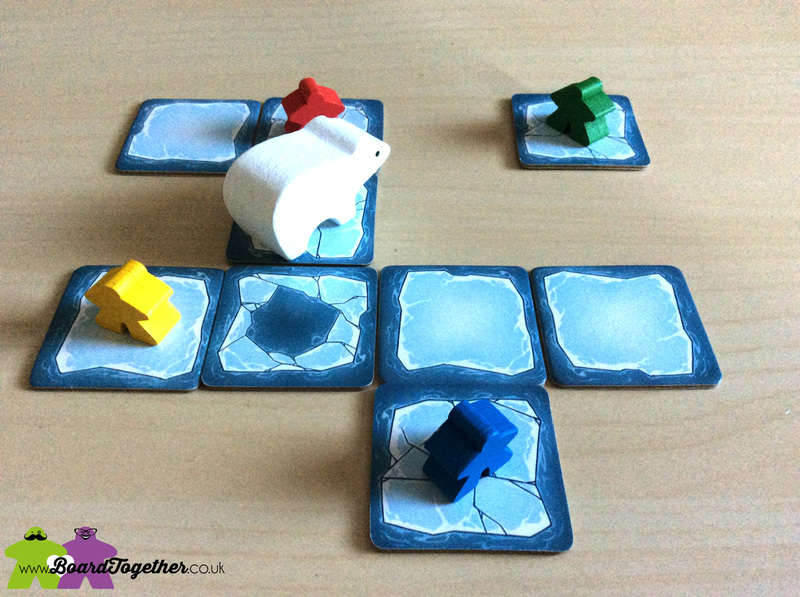 Although this does not translate to actual gameplay as you have a plain wooden polar bear token to move. That is still epic though! 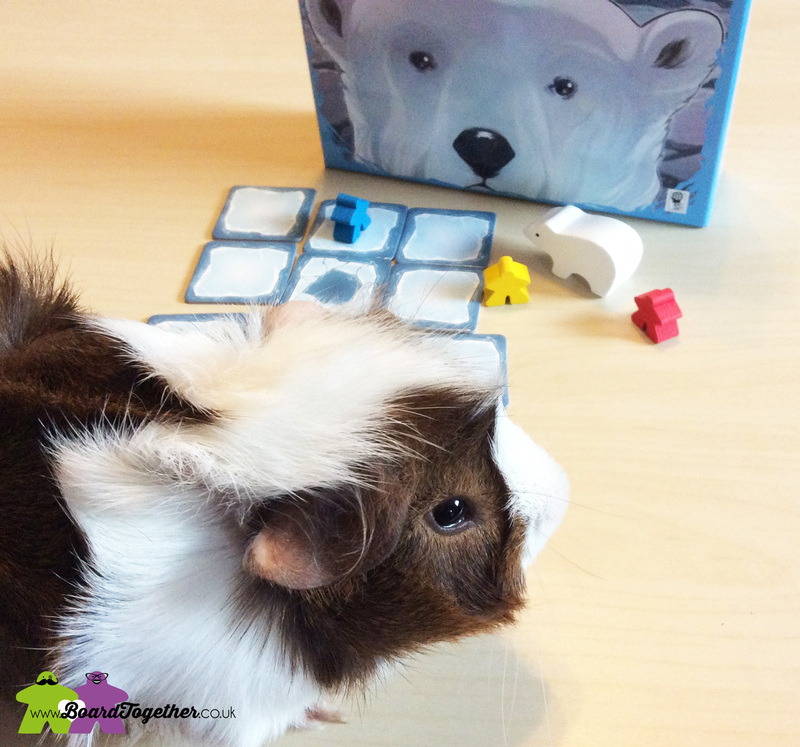 If he is swimming in the water we sit him on his bum so he looks like he is treading water, then if he gets close to a meeple we both make a little growling noise! 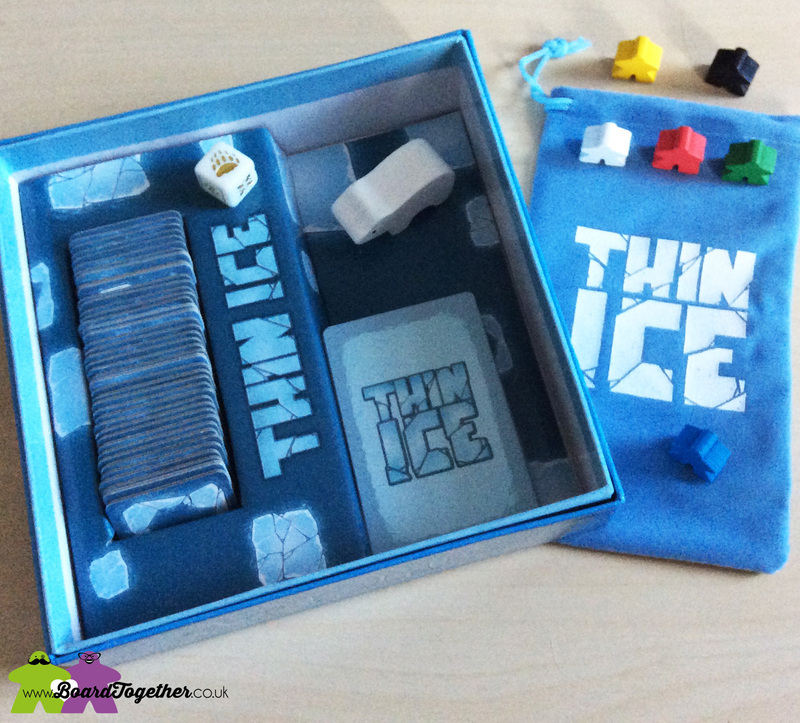 The tiles and cards are made from good quality stock and feel like they will stand up to a fair few games. We also have a funky custom die with gold icons and a little branded drawstring bag to hold bits and pieces. When playing with the action cards things can get a bit tense. It really is a survivor game and you play the action cards with a bit of a “take that – ha” attitude, “my meeple is gonna LIVE”! Poor Mike has yet to win this game, he keeps setting his own meeples adrift. So it is a bit of a hollow victory for me. I guess we just have to keep playing . . . This game feels a lot like Forbidden Island, but without the frustrating rising water levels that I hate. There are similarities to Hey! That’s My Fish, the whole ice thing and removing of tiles. 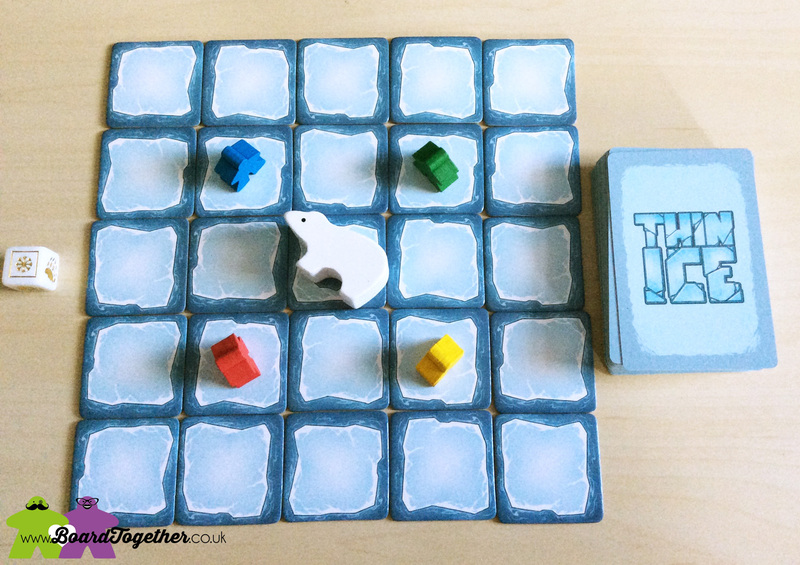 It also reminds us of the phone game Snake, moving around in similar patterns to keep the ice from melting too quickly.